Maxim’s 22 opened in October 2012 to the delight of local gastronomes long awaiting a French eatery in our area. Drawing from worldwide travel and culinary experiences, Chef/Owner Josh Palmer, along with parents Terry and Bud Palmer, envisioned a French Bistro and Brasserie in downtown Easton that would fill the need for those of us hungering for French food. Maxim’s 22 surely fits the bill. This is a very popular spot following in the footsteps of the Palmers’ other successful restaurant, Sette Luna located a few blocks away on Ferry Street. I am a huge fan of Maxim’s 22 and visit whenever I am able, whether it be for a drink before or after a State Theatre performance or dinner with friends. The ambiance at Maxim’s is charming. Its tastefully-casual atmosphere enhances the frosted-glass windows, tin ceilings and low lighting truly creating the feel of a Parisian bistro. It is very attractive yet not too fancy, as it should be, with wonderful soft background music. Maxim’s 22 combines the welcoming feel and comfortable foods of a true French Bistro with the libations of a Brasserie offering 22 beers on tap, 18 wines by the glass and 130 by the bottle, all selected by Chef de Cave Elizabeth Carlson-Palmer, Josh’s wife and one of the few certified sommeliers in the Lehigh Valley. I dined recently with my friend Sandi and started with a drink at Maxim’s 22’s interesting bar. Michele shook up an icy Kettle One Martini for Sandi and a perfect Cosmopolitan for me as we spoke with Manager Georgia Hatges, who divides her time between here and Sette Luna. There are 22 seats at the bar, which is part of the “22” story at Maxim’s. We were shown to our table in the front dining area near the window and our server Jessica greeted us with a wine list and the evening’s specials that included Pork and Beer Stew made with Winter-Warming Brown Ale and Red Snapper. She also served up a basket of sliced crusty baguettes that you’ll always find on display atop a beautiful sideboard as you enter the restaurant. Maxim’s breads, while not baked in-house, are delivered fresh daily and are simply delicious. Sandi and I selected a Malbec/Nieto from the wine list to sip while we decided on our tasting meal. We first shared the evening’s special salad of fresh mixed greens, caramelized walnuts, wine-soaked cranberries, julienned apples and fried goat cheese all dressed in an aged sherry viniagrette. The salad was very crisp with a delightful blend of flavors and, with the fresh apples and liquored berries, it was just perfect for the first course. My husband Tom was out of town, so Sandi and I shared the Foie Gras in his honor. This evening, the Foie Gras was prepared with fresh strawberries atop brioche French Toast. This was Sandi’s first fresh, pan-seared Foie Gras experience and described it as “delightfully delectable.” I found it delicately sweet and not overpowering the taste of the meat. We both enjoyed this dish very much. Tom is very jealous so I promised to take him back very soon. Other salad choices on the menu include a House Salad with bibb lettuce, bacon, chopped egg, blue cheese and croutons; Frisée with a sunny side up egg (which is delicious); Roasted Beet with Chèvre, toasted walnuts and poached pear; traditional Caesar and one of my favorites – Tuna Nicoise with haricots verts, olives and fingerling potatoes. We very often share appetizers at Maxim’s 22 and have tried many of their selections. I love their Onion Soup Gratinée. It is very rich and has just a small touch of tomato that adds a unique sweet twist to an old favorite. Tom loves the Escargot and Frog’s Legs, both of which would delight any garlic lover. My daughter Kate and I not long ago shared the Brie en Croute, as well as the Charcuterie Plate offering house cured meats and pâté along with a glass of wine. Rounding out the hors d’oeuvres are Steak Tartare, steamed mussels, marrow bones, Coquilles St. Jacques, Gravlax and Crispy Duck Confit Legs with frisée and cranberry gastrique. Le bar à huitres (seafood raw bar) offers fresh oysters, clams, mussels and shrimp which may be ordered by the dozen or on a tower to serve your party. Continuing with our meal, since we already sampled two plates, we ordered the Pan Seared Dayboat Scallops to share. The four fresh large sea scallops were perfectly pan-seared (cooked “through” as I requested) and served atop white beans in truffle oil and spices. The scallops are wonderful and I highly recommend them. We both enjoyed this very rich and filling dish. It was a perfect entree to round out our meal. On previous visits, I have ordered the Country Dijon Crusted Roasted Salmon Filet with lentil salad and Trout Amandine from the menu. Tom loves the Ale Braised Pork Shank with potato puree and Brussels Sprouts; the Half Roasted Chicken with lemon herb jus and, of course, the perfect bistro meal – Maxim’s 22 Cassoulet with duck confit, pork belly, marrow bone and sausage. 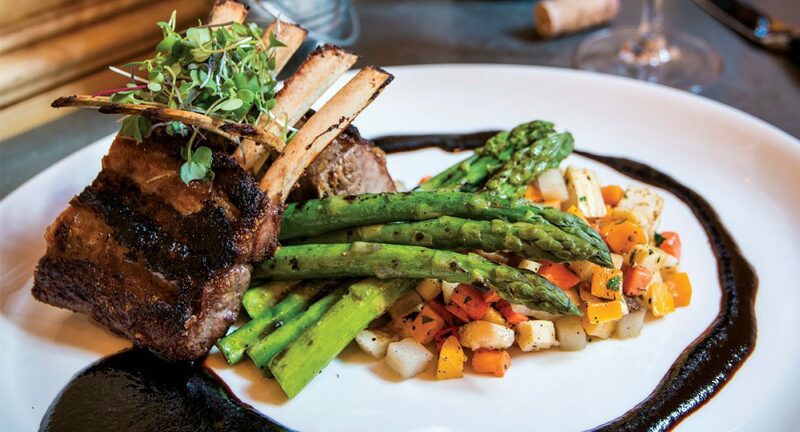 Also on the entree menu are Seared Duck Breast with duck confit hash, cranberry gastrique and asparagus and Rack of Lamb with Madiera rosemary glace, root vegetables and asparagus. A selection of steaks is on the list and for those with a taste for a juicy burger, there are four variations from which to choose. Maxim’s 22 serves lunch Tuesday to Saturday until 4 p.m. with a menu that includes Ham and Brie Baguettes, Croque Monsier and Croque Madame, Quiche du Jour and French Dip. Brunch is served on Sunday, 10 a.m. to 3 p.m. with a delicious array of choices that includes Berry Crepes, Chicken Crepes, Smoked Salmon Benedict as well as Classic Eggs Benedict and Brioche French Toast plus much, much more. Their “Future Foodie” menu offers a unique selection of meals geared towards kids eight and under. Well, time had come for our dessert choices. That evening we decided to share two – the decadent, chocolatey Bon Bons with Tahitian vanilla ice cream and the Crème Brûlée with strawberries. We shared strong, hot French Press Coffee that kept me up all night… but it was well worth it! The desserts at Maxim’s 22 are all wonderful but these are by far my favorites. The Bon Bons are perfect for the chocolate lover and the Crème Brûlée is very light and slightly caramelized just the way I like it. The Palmers have taken every step to bring the feel of a true French Bistro to our area. The decor is not overstated but yet very chic – right down to the clean, well-appointed washrooms with sleek white subway tiles. Everything is, quite simply, beautifully done – but not fancy. Be sure to check out the private dining room that seats around 60 at the rear of the dining room. It is adorned with new and vintage French-themed posters. Josh decorated the room himself, and it’s a great venue for a special meeting or event. Maxim’s 22 is located in the beautifully restored, historic 154-year-old Pomeroy Building at 322 Northampton Street, Easton. There is ample street parking and the parking garage is just around the corner. Reservations are taken for groups of six or more but you may call 30 minutes prior to your arrival and your name will be placed on their waiting list. Please call 610.252.2622 or visit maxims22.com for more information.